System to evaluate and update objects for editing and animation. Sergey Sharybin (sergey) closed T56778: Alembic Override Frame does not update on playback. as Resolved by committing rB2f4bd632396c: Fix T56778: Alembic Override Frame does not update on playback. Brecht Van Lommel (brecht) closed T56729: Crash while interacting with Graph Editor as Resolved. We fixed a similar bug at some point after this report, appears to be fixed now. Jacques Lucke (JacquesLucke) merged task T62272: Scene custom properties crash into T61014: Assert adding a driver that uses a single property of a scene ID. Jacques Lucke (JacquesLucke) merged T62272: Scene custom properties crash into T61014: Assert adding a driver that uses a single property of a scene ID. Sergey Sharybin (sergey) closed D4229: Bugfix T60185: loops in graph produced unorderly clean-up. Needed to apply manually, and forgot to mention the revision in the comment. Brecht Van Lommel (brecht) added a comment to D4229: Bugfix T60185: loops in graph produced unorderly clean-up. I don't have a better local solution. Brecht Van Lommel (brecht) added a comment to T56635: Driver/Keyframes on object visibility do not update viewport. For that issue, see T62094: Unable to insert a hide_viewport keyframe via the UI. Sergey Sharybin (sergey) added a comment to D4229: Bugfix T60185: loops in graph produced unorderly clean-up. @Brecht Van Lommel (brecht), do you feel strong here? Can't think of a better solution than to introduce more relations. Sergey Sharybin (sergey) accepted D4229: Bugfix T60185: loops in graph produced unorderly clean-up. @Dalai Felinto (dfelinto), this change has nothing to do with solving cycles, it just makes blender to not crash when there is a cycle. From reading the patch it seems fine to me. Stephen Hamacek (hammers) added a comment to T56635: Driver/Keyframes on object visibility do not update viewport. Dalai Felinto (dfelinto) added a comment to D4229: Bugfix T60185: loops in graph produced unorderly clean-up. The patch (updated on - P934) seems to work (no crashes). Jacques Lucke (JacquesLucke) closed T59453: hook bug as Archived. Martin Capitanio (capnm) added a comment to T62272: Scene custom properties crash. Nohra Seif (NSeif) added a comment to T56635: Driver/Keyframes on object visibility do not update viewport. Hello, I am facing the same problem. Philipp Oeser (lichtwerk) added a project to T62272: Scene custom properties crash: Dependency Graph. Philipp Oeser (lichtwerk) closed T56062: Deleting Node with driver attach causes crash as Resolved. This seems resolved for me. Sergey Sharybin (sergey) added a comment to T56635: Driver/Keyframes on object visibility do not update viewport. Currently only objects visibility is animated. Bronson (DBAGibbz) added a comment to T56635: Driver/Keyframes on object visibility do not update viewport. Sylvain (Micool) added a comment to T56635: Driver/Keyframes on object visibility do not update viewport. I'll test it in the next build. @Brecht Van Lommel (brecht), @Sylvain (Micool), fixed it now. @Sylvain (Micool), please create a new bug report about that. Sergey Sharybin (sergey) closed T56635: Driver/Keyframes on object visibility do not update viewport as Resolved. Committed quite some fixes in various related ares and this report is supposed to be fixed now! The minimal revision required is rB846d265a06e. Brecht Van Lommel (brecht) merged T61900: hide_viewport is not working in viewport if it is set by driver into T56635: Driver/Keyframes on object visibility do not update viewport. Brecht Van Lommel (brecht) raised the priority of T56635: Driver/Keyframes on object visibility do not update viewport from Confirmed, Medium to Confirmed, High. Sergey Sharybin (sergey) closed T61473: Blender crashes when moving object with hair or changing particle settings as Resolved by committing rBf2a21472c493: Fix T61473: Crash particle system is updating. Sergey Sharybin (sergey) added a comment to T61473: Blender crashes when moving object with hair or changing particle settings. Weird. Was looking for quite some time =\ Thanks! Brecht Van Lommel (brecht) added a comment to T58339: Blender does not refresh modifier related animation (Dependency graph problem?). There will be more optimizations. 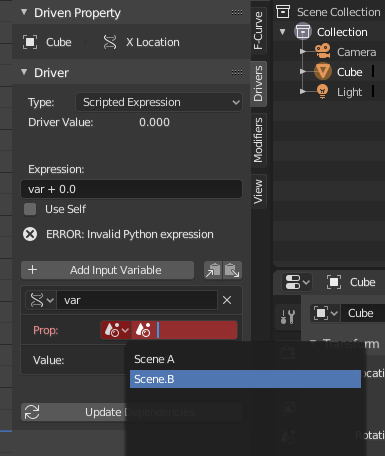 Philipp Oeser (lichtwerk) raised the priority of T61473: Blender crashes when moving object with hair or changing particle settings from Needs Information from User to Confirmed, Medium. Philipp Oeser (lichtwerk) updated the task description for T61473: Blender crashes when moving object with hair or changing particle settings. 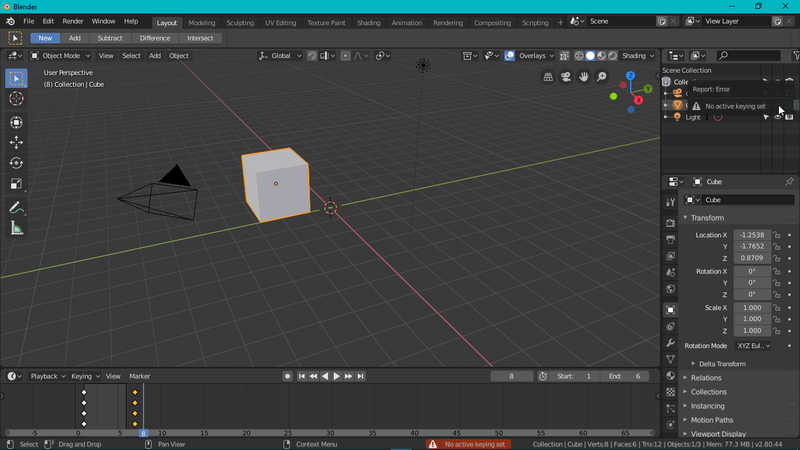 Sergey Sharybin (sergey) lowered the priority of T61473: Blender crashes when moving object with hair or changing particle settings from Confirmed, Medium to Needs Information from User. Please always attach .blend file which demonstrates the issue. Christoph Werner (Taros) added a comment to T58339: Blender does not refresh modifier related animation (Dependency graph problem?). At the moment my demo scene with some modifiers is at 5 fps in version 2.8. In v2.79 its faster and runs at about 8 fps. Campbell Barton (campbellbarton) closed T61353: 2.8 beta crashes when converting curve to mesh as Resolved by committing rB6074f62d1a09: Fix T61353: Crash converting a curve to a mesh. Leonard Siebeneicher (siebeneicher) added a comment to T61391: MeshDeform Modifier does not work on a solidified planar mesh. Thank you for your effort. It works now. @Sergey Sharybin (sergey), can you review this? Brecht Van Lommel (brecht) closed T58339: Blender does not refresh modifier related animation (Dependency graph problem?) as Resolved. This appears to be solved in the latest builds. Philipp Oeser (lichtwerk) raised the priority of T61353: 2.8 beta crashes when converting curve to mesh from Needs Information from User to Confirmed, Medium. @Campbell Barton (campbellbarton) : is this OK to stay on your desk? Philipp Oeser (lichtwerk) assigned T61473: Blender crashes when moving object with hair or changing particle settings to Sergey Sharybin (sergey). Philipp Oeser (lichtwerk) triaged T61473: Blender crashes when moving object with hair or changing particle settings as Confirmed, Medium priority. 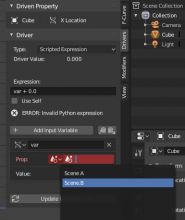 Yassir Amry Priyono (yassir_a_p) added a comment to T56635: Driver/Keyframes on object visibility do not update viewport. If some people with earlier build can insert keyframe on viewport visibility, even if they don't update correctly, is this one more regression from earlier build or intended to prevent crash? I've tried this on few builds that I still have, with the earliest build on 552b2287db86 (01/02/2019) and the latest build blender-2.80-d3870471edd7-win64 (12/02/2019). I've just discovered this problem. I don't really understand the script workaround, but I know it's something with the internal code not updating. Because if I move a keyframe of Disable Render channel from the object, it will be updated, but then stays like the last render until I move any keyframe of Disable Render channel again. Sergey Sharybin (sergey) closed T61431: This metaball-array kills blender as Resolved. There were few things wrong in dependency graph and instancing code. Should be fixed now. Thanks for the report, closing. Philipp Oeser (lichtwerk) assigned T61431: This metaball-array kills blender to Sergey Sharybin (sergey). Philipp Oeser (lichtwerk) added a comment to T61391: MeshDeform Modifier does not work on a solidified planar mesh. Bastien Montagne (mont29) closed T61391: MeshDeform Modifier does not work on a solidified planar mesh as Resolved by committing rB7cca0f9998a3: Fix T61391: MeshDeform Modifier does not work on a solidified planar mesh..
Bastien Montagne (mont29) added a comment to T61391: MeshDeform Modifier does not work on a solidified planar mesh. Eugenio Pignataro (oscurart) added a comment to T56635: Driver/Keyframes on object visibility do not update viewport. I believe that being able to control visibility on viewport is very important. Brecht Van Lommel (brecht) merged T61395: "hide_viewport" conflict with drivers. into T56635: Driver/Keyframes on object visibility do not update viewport. Philipp Oeser (lichtwerk) merged T61410: Driver-controlled renderability unpredictable, and no drivers avail. on viewport visibility into T56635: Driver/Keyframes on object visibility do not update viewport.